Four rounded loveseats with thick, oyster grey cushions and a 54-inch plank-top dining table in hand-woven all-weather wicker. 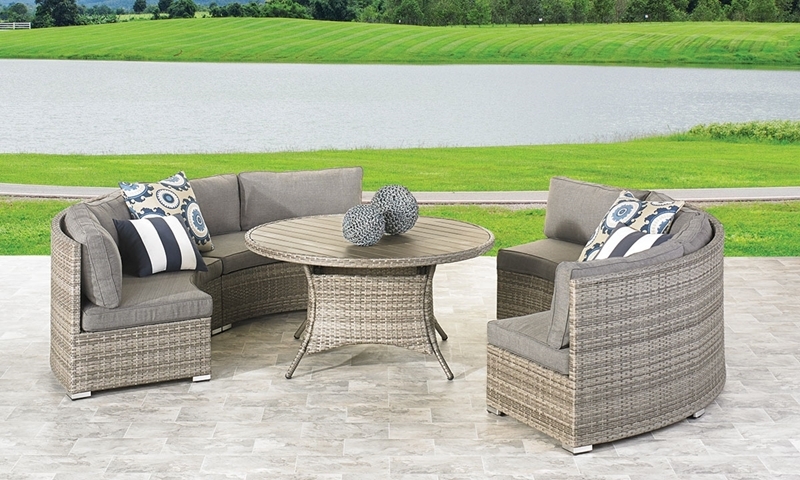 The San Marco dining set makes it easy to gather round for a delicious meal while enjoying the evening breeze. Its loveseats create a casual feeling of unity with a unique rounded shape that allows for multiple configurations. This seating space for up to eight is made extra comfortable by thick outdoor-grade cushions in a chic oyster grey fabric. The 54-inch table showcases a pristine plank top that won’t splinter, rot or fade thanks to its low-maintenance poly lumber. Heavy-duty aluminum frames covered in hand-woven resin wicker help ensure that this outdoor dining look will last throughout every season.